Dr. Kosterman is a graduate of Logan Chiropractic College in Chesterfield, MO where he received a Doctor of Chiropractic degree. Dr. Stephen F. Kosterman is a North Carolina native. Born in Clinton, NC and Seventh Chiropractor in the Kosterman family, which spans over four generations. 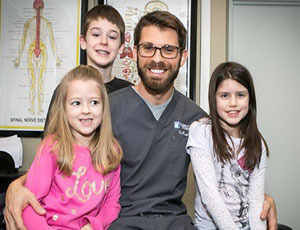 It is Dr. Kosterman’s goal to help as many people as he can through chiropractic care. He loves nothing more than to see people become healthy individuals after struggling with various symptoms for far too long. Come see for yourself how chiropractic care can impact your life!